Effect: A white hankie is produced from an empty bag. The hankie is then used in several tricks; knots appearing, vanishing, etc. Then the magician attempts to vanish it in the bag. After many "frustrating" attempts, he states that he is tired of a hankie making him look silly! 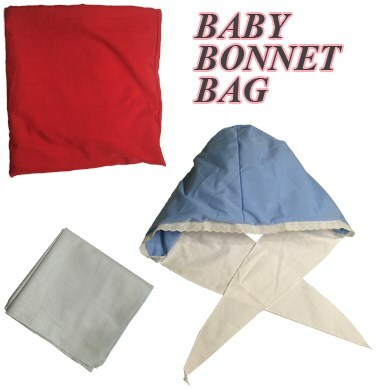 The bag and hankie then instantly transform into an adult-sized baby bonnet, which the performer wears.